The area of new media art is a complex and challenging sphere I do not believe my work is completely submerged in this area, rather touching off of it as a means of response to the world I find myself within. 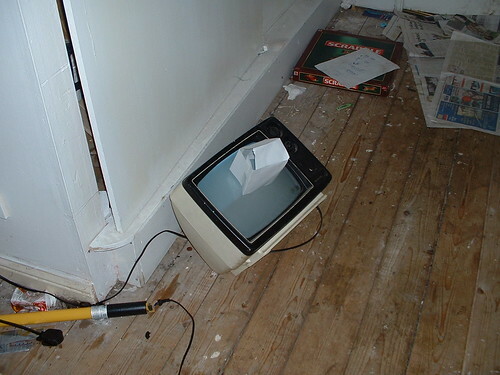 I am very much a televisionaly educated child thus this sense of analog appeals to me (using TVs and VCRs) because of the ability to physically manipulate this apparatus which I still don’t fully understand, as opposed to the metaphysical manipulation of computers if you will that is generally associated with new media art. 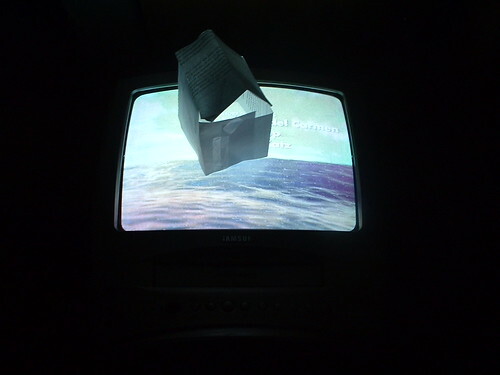 Introduction of the VCR for the first time gave control to the audience of what they could watch. this interests me the idea that you can manipulate imagery from your own living room, this idea I have been messing around with. Editing moving imagery live as its being presented to me gave me a buzz or this sense of urgency about reappropriating this material as it arrives to your television set, because in a sense it is fleeting unlike going down to the video store and methodically choosing what film or latest TV programme you want to reapropriate from.